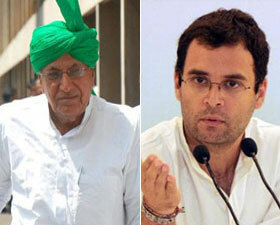 Jalandhar: Former Haryana Chief Minister Om Prakash Chautala has accused Congress general secretary Rahul Gandhi of tax evasion in connection with a piece of land purchased by him in Palwal district’s Hasanpur village in 2008. Chautala, while addressing a press conference here yesterday, demanded that the matter be investigated by a sitting judge of the Supreme Court. "Rahul Gandhi purchased a piece of land measuring around 6.5 acre in Hasanpur village in Palwal district of Haryana in March 2008. He resorted to tax evasion in it. Rahul bought this land at the rate of Rs 1.5 lakh per acre as mentioned in the land registration deed even as its valuation by the government at that time was Rs 8 lakh per acre," Chautala told reporters. The INLD chief further stated that the government value of the land given to the Congress scion at the rate of Rs 1.5 lakh per acre was Rs 8 lakh per acre while its market value was much more at Rs 35 lakh per acre. Chautala also claimed that Haryana Chief Minister Bhupinder Singh Hooda's "benevolence" has helped Robert Vadra (Rahul's brother-in-law) purchase properties worth several crores allegedly at "throw away prices" and demanded a probe by a sitting Judge of the Supreme Court. Vadra, too, is embroiled in a controversy over various land deals in Haryana. Congress general secretary Rahul Gandhi has categorically dismissed as "entirely false, utterly baseless and defamatory" allegations levelled against him by Chautala, and said that there was no irregularity in the land purchased by him in Haryana. It also said that the Congress leader paid stamp duty of six percent amounting to Rs.1.58 lakh for the purchase. "Allegations made by Om Prakash Chautala against Rahul Gandhi in his press conference this evening in Jalandhar are entirely false, utterly baseless and defamatory," it said.